Trussardi began as a glove-making company in Bergamo, Italy, in 1911 and has since branched out into clothing/accessories, fragrance, design, entertainment/culture and hospitality/food. Trussardi fragrances are not easy to come by in the U.S. (Like many other European perfumes that never make it to stores here, Trussardi perfumes can often be found at online U.S. discounters within a year of their European release.) From the moment I first read about Essenza del Tempo, I wanted to try it, and I finally got around to buying a bottle online last week. Essenza del Tempo was “inspired” by the slow food movement in Italy. Perfumer Sophie Labbé developed Essenza del Tempo, and it contains fragrance notes of bergamot, amber, ambrette seed, carrot seed, ginger, iris, “sun-drenched” flowers, coffee, balsamic vinegar, and cedar. Essenza del Tempo’s opening notes (with juicy bergamot, carrot seed and musky ambrette/cumin) smell like a chilled platter of antipasti (yes, there’s a slice of cold meat on the plate). This food-y opening is sheer and light, like an Eau de Cologne, but things warm up and intensify quickly. Essenza del Tempo provides amusing twists and turns but it’s not a “weird” perfume at all (if that worries you). The vinegar, olive oil, coffee, and carrot are handled subtly and remain close to skin (those around you will NOT think you smell like a ristorante or “lunch”). I wish Labbé had upped the ante(pasti) and highlighted the unusual (risky) food notes, but no doubt such a treatment would have alienated Essenza del Tempo’s intended audience (IS there a “weird” Italian perfume on the market? has there ever been?) As it stands, I still enjoy wearing Essenza del Tempo; it’s a good year-round, casual fragrance with just enough “strangeness” to keep me interested. Essenza del Tempo Eau de Toilette has very good lasting power and reasonable sillage; it’s marketed as a unisex fragrance but, to me, it has a masculine vibe. Europeans should have no trouble finding Essenza del Tempo, but if you live in the U.S. chances are the only way you’ll smell it is to buy it. Essenza del Tempo comes in a handsome, hefty bottle on “legs” with a leather strap that connects the cap to the bottle — and Trussardi to its leather-goods past. Essenza del Tempo also comes in body wash, aftershave balm, body lotion, and deodorant. Note: top Greyhound image [altered] via Wikimedia Commons. Thank you for the wonderful review Kevin. This sounds like one fragrance that I should try in body wash or body lotion form so that I can find out how the combination of coffee and balsamic vinegar would smell. I honestly cannot imagine that one. I LOVE the idea of an olive oil note. Good quality olive oil has such a glorious bouquet and I wish more perfumers would make use of it. Really good quality balsamic vinegar is also wonderfully aromatic. It is the traditional Italian topping for fresh strawberries, and I think that the combination of berries and b. vinegar would make a great summer cologne. Peke: I agree…a sparkly strawberry-balsamic vinegar EdC would be nice. Good idea to try this in lotion or body wash first. I have always wondered about this one. I really love Trussardi Inside and the original Trussardi edp for women. They are well done. SaraB: it’s too bad the Trussardis are so hard to come by in the U.S…I’d like to try them all. Ooh, this sounds so interesting! I’m super-bummed to think I might not get to test it! I’m not yet to the point of bravery/ compulsion to buy a FB unsniffed, but this sounds like it could be very much up my alley. . . M.R. : I’ve been waiting several years to try this and finally gave in since I never FORGOT about it. So, it was a good bought-unsniffed purchase for me. Oh, geez. . .I just checked online, “just for curious,” and it looks like this is awfully affordable. . .$40-ish. . .good thing I don’t know any capable enablers! I love the idea of the slow food influence! Hilde Soliani has some very interesting food influenced scents, as well. I guess this is a manifestation of that wonderful Italian dedication to the good things in life. I’ve always been curious about this line, but it’s such a mystery. It doesn’t appear in The Guide at all, which I took as not a good sign. Now I realize it may have been just the lack of samples. Thanks for throwing caution to the wind, Kevin, and very glad it worked out! Noz: LOTS of stuff is missing from The Guide so I don’t let that worry me…I’ve heard good things about the Trussardi line and a kind person is sending me lots of samples…so I’ll find out soon. This sounds like something I would like to try….but it will probably not be available in HK. Merlin: HA! 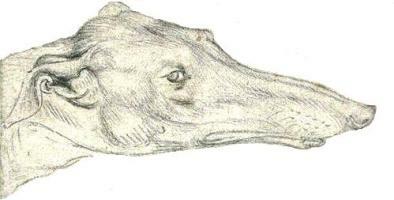 Me too, I love the good ole pug and bulldog “nose” myself but that greyhound/borzoi nose can be so elegant. HKM: Those greyhound noooooooooooooses can get into LOTS of trouble. I think your walking stick sounds way cool! Jolie: I think they’re still for sale…and there are photos on the Trussardi site too.